Every Wednesday at 3:00 p.m., Spirit in the Desert provides a mid-week oasis of meditation and Holy Communion for anyone on the campus of Spirit in the Desert and for people in the surrounding community. The service is held in one of Spirit in the Desert’s chapels, both of which have peaceful and majestic views of the Creator’s Sonoran Mountains. Everyone, of any faith or no faith, is welcome to experience moments of silent meditation, quieting music, scripture, prayer, a Touchpoint, and Communion. Touchpoint is a reflection on where God touches our life story. 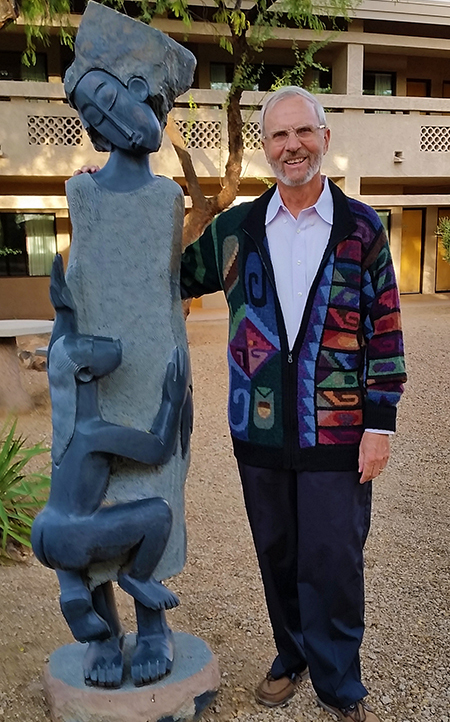 It is a short homily by Spirit in the Desert Faith Mentor, Jim Hanson, based on a Biblical story of people in the Old and New Testaments and their relationship with God. Our spiritual ancestors’ experience of God’s grace connects with our lives in the present and our relationship with the Divine. An inspiring Daily Devotion from Spirit in the Desert Retreat Center is available to you 365 days a year. You can read them on this website and you can also subscribe to receive Daily Devotions to your email. Subscribe HERE. Pastor Steve Holm, who has authored popular Advent and Lenten devotionals, is the writer of Daily Devotions which illuminates biblical texts through short meditations. Click HERE to read more about Steve, his approach to writing and his love of golf! 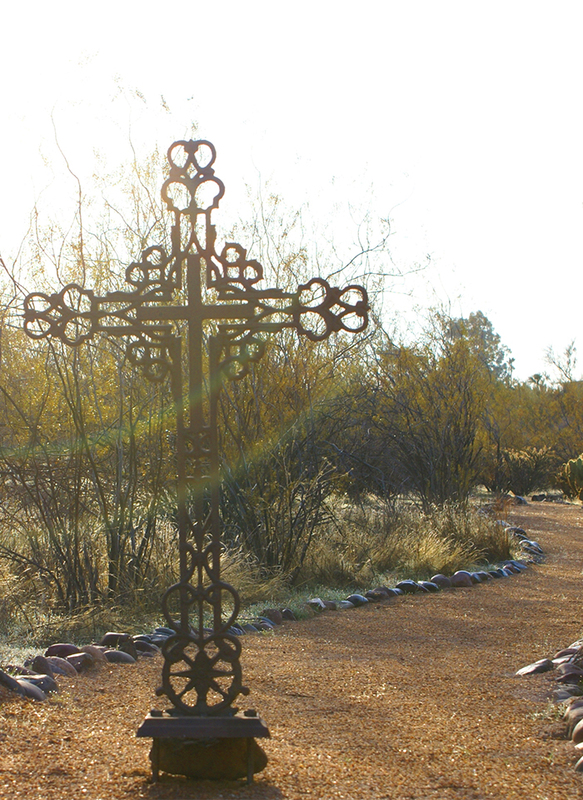 There are three desert walking paths on the grounds of Spirit in the Desert Retreat Center suitable for quiet meditation and contemplation. The Labyrinth in the Desert is patterned after the famous Labyrinth in Chartres Cathedral near Paris, a symbol of pilgrimage. The Islands of Silence are seven stops on a path that begins at the top of the hill, crosses a wash and concludes at two benches at the bottom of the hill. Each island is a symbol for meditating on places during our life’s journey. The Prayer Pathway provides Seven Steps of Morning Prayer by Joyce Rupp: Gratitude, Love, Hope, Compassion, Generosity, Laughter, and Patience. Retreat guests can walk each of the paths with audio-guided meditation. In house cell phones with ear buds can be checked out from the Estrem office. They are also available for use by people in the community who wish to meditate while walking the paths. Also on our campus are three beautiful fountains, providing a quiet place for contemplation. Everyone’s faith journey is different. Each journey is unique to one’s own history and experience. Sharing that journey with someone else can be a powerful experience. In the speaking and in the sharing one can clarify and bring into focus where one has come from and open oneself to what lies ahead. 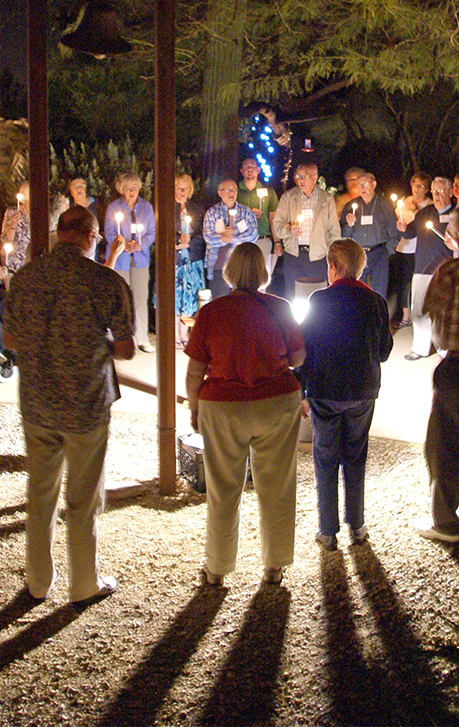 Spirit in the Desert provides spiritual direction for those who wish to explore their faith journey more deeply. Jim Hanson serves as our on-campus “Faith Mentor.” The dictionary defines a mentor as ‘an experienced and trusted advisor’. Jim is available for conversation throughout the day and evening for those who would like to reflect on their faith journey. Jim has worked with churches and individuals as far away as in Japan, as well as churches in the U.S. involved in Chinese, Hispanic, and other ministries. No matter where you are in your life of faith, just beginning or far along, Jim is available to spend time with you, hear your story, and reflect with you on the depth and mystery of your experience with the Divine.